Home Business How did London become Fintech’s golden goose? The year is 2008. The banking system has laid waste to the world economy. The resolute banks are the only signs of life in a barren landscape. Customers are cynical and disenchanted with traditional financial models. The field is clear for a “Cambrian explosion” of innovation. The year is 2013. There’s more money. The banks end their period of self-flagellation and technology moves on. Canary Wharf, traditional home of the big banks, opens its doors to the disruptors at Level39. The year is 2014. The UK takes $519million in venture capital funding, half the figure for Europe as Chancellor George Osborne declares he will make the UK the “fintech capital of the world”. The year is 2016. 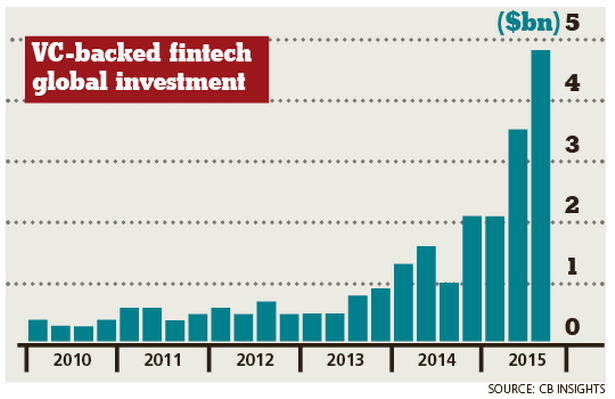 Fintech is a sizeable proportion of the financial services sector. No big bank is swatting away the hipster fleas. Instead, they’re taking meetings, hosting incubators. Big names, like Citigroup’s Vikram Pandit and Morgan Stanley’s John Mack are leaving corporate banking to find models that challenge their former paymasters. Goldman Sachs estimates that fintech could take more than $4.7trillion in revenue and $470billion in profit from the traditional companies. Funding Circle and TransferWise achieve “unicorn” status – attracting valuations of more then $1billion. Around the world, fintech startups – peer to peer lenders, digital currencies, cross-border transfer – scour the globe for the best place to set up. Berlin, New York, Frankfurt, Malaysia. But London sets the pace, creating £20billion of revenue in 2014. That figure could double by 2020. Why? “London has the ‘tech’ of the West Coast, the ‘fin’ of New York and the lobbying of Washington.” So says Lawrence Wintermeyer, CEO of Innovate Finance , an independent organisation serving the fintech community. 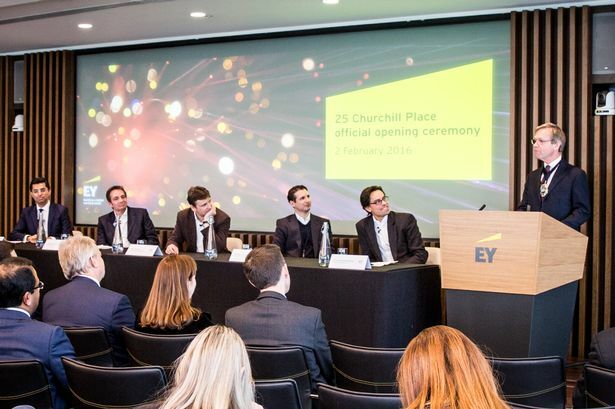 He’s speaking at the opening of EY’s new offices at 25 Churchill Place in Canary Wharf. German Christoph Rieche, co-founder and CEO of small business lender iwoca.co.ukthought about Berlin but came here instead. “The decision to start in London was because there was a much deeper pool of talent relative to, say, Berlin. Also there was a much deeper pool of capital. We’re based in Soho near [hedge fund hub] Mayfair where hundreds of billions are being managed. So what has London got going for it aside from the geography of the key players? In an exercise in a global fintech conference in Singapore, London was set against seven rivals. Some 82% of respondents said that “proximity to subject matter expertise” was a defining factor for London. London has the largest population of mathematicians and scientists dedicated to financial services in the world with more than 44,000 working in the fintech industry. That’s a double-edged sword according to Giles Andrews, co-founder and executive chairman of lender zopa.com . “There is a breadth and talent in London so it’s hard to get the best. Where we struggle is in the purest of those skills, the deep super-geeky risk analyst, the deep tech side and perhaps on the UX side. Lawrence says: “The talent base is one thing but the second thing that is really quite extraordinary about London is that we have a digitally switched on Government when it comes to fintech. EY’s new Fintech Adoption Index shows that 15% of consumers already use Fintech Propositions – like easy payment and border transfer apps – with that figure rising to 25% in London. Having a ready market on the doorstep helps in early stage growth. He says that simple, ease-of-use products are gateways to more significant product suites such as short-term lending and savings and investment. What are the biggest threats to London’s rise? Shortage of talent, either through the home-grown education system or complicated visa controls, concern all the entrepreneurs. Giles says: “My children don’t need motivating that computers are fun, but they do need motivating that coding is fun. Then there’s the really important phase when people want to come from all over the world to study.